While in San Diego a few weeks ago, I had a little time to meander around their local Whole Foods store looking for NEW to ME dairy-free, nut-free, peanut-free and egg-free products. I know I am NOT the only one who loves to take their time browsing through the aisles, ESPECIALLY when kid-free. Came across a new popsicle I am hoping to find in Boise. 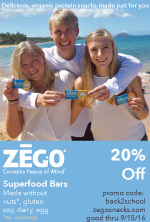 They are FAT FREE, DAIRY FREE, GLUTEN FREE and have NO ARTIFICIAL INGREDIENTS. 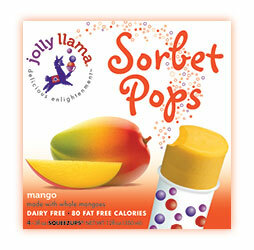 Jolly Llama Mango Sorbet Pops, distributed by The Jolly Llama Company, LLC, 1450 2nd Street, Santa Monica, CA 90401. 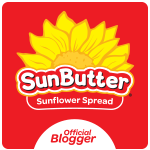 Ingredients include: MANGO PUREE, DISTILLED WATER, CANE SUGAR, NON-GMO CORN SYRUP, NATURAL FLAVOR, CITRIC ACID, STABILIZER (GUAR GUM, XANTHAN GUM), VITAMIN C (ASCORBIC ACID), VITAMIN A (PALMITATE). These all-natural frozen treats are delightful. I can't wait to try out all of their flavors, which include: strawberry, banana coconut, pineapple coconut, and raspberry. Not only do Scott and Michelle Jacobson focus on promoting healthy living with their products, but they are also actively involved in giving back to their community. For more information about their endeavors, visit their Jolly Llama Community Page.